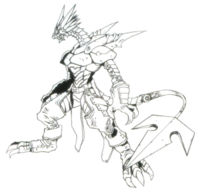 A form that evolved from Gumdramon by removing its Kinkoji. 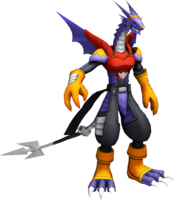 It is clothed in Battle Armor made of a special rubber, which manifests Gumdramon's characteristic elasticity at its maximum and further strengthens its defense. Its wings have gotten larger, enabling high-speed flight. By changing its tail into a Tail Anchor, it has become able to arrest the opponent in addition to tearing them apart. 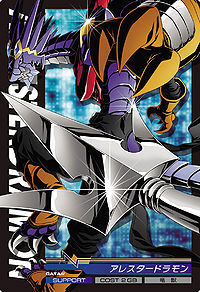 Its Special Moves are unleashing high-speed punches while bending both of its arms (Mach Flicker), wielding its Tail Anchor to chop up the opponent (Flog Shot), bisecting them with its super-sized Tail Anchor while performing a single revolution (Spin Caliber), and adding to its "Spiral Shredder", in which it rapidly spins to cut them to pieces, by becoming countless revolutions of light then cleaving them apart (Prism Garrett). Mach Flicker  マッハフリッカー Mahha Furikkā Unleashes a flurry of punches from its flexible arms. Flog Shot  フロッグショット Furoggu Shotto Chops the opponent with its Tail Anchor. Spin Caliber  スピンカリバー Supin Karibā Bisects with a swing of a super-sized Tail Anchor. Spiral Shredder  スパイラルシュレッダー Supairaru Shureddā Spins rapidly to cut the opponent with its Tail Anchor. 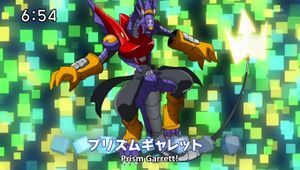 Prism Garrett  プリズムギャレット Purizumu Gyaretto Creates spirit-like copies of itself that all slash the opponent at once. DigiXrosed with a giant eraser, then used the eraser replacing its Tail Anchor to erase a monster brought to life by Ekakimon. 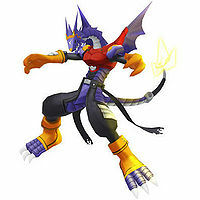 Arresterdramon in Digimon Xros Wars. 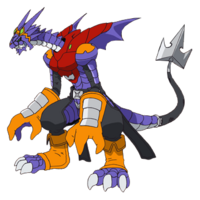 Arresterdramon evolves from Gumdramon, Tagiru's partner Digimon. The Digimon Hunt is Thriving! The Virtuoso Hunter of the Shopping District!! Landing in Hong Kong! Protect the Super Beauty Idol!! Tagiru Turns Soft!? 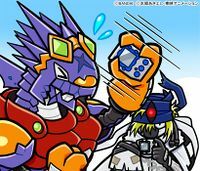 Gumdramon's Big Crisis!! Delicious? Or Disgusting? The Digimon Ramen Contest! A Heart-throbbing Horror Experience! The Spirit Hunter Roars!! Great Undersea Adventure! Find the Treasure of Dreams Digimon! 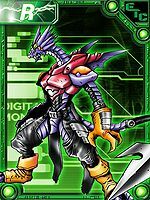 Arresterdramon is only obtainable as a collectible card. 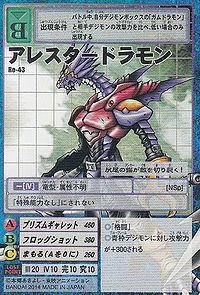 Its card is part of the Gumdramon Evolution (ガムドラモン進化 Gamudoramon Shinka) set. Arresterdramon is classified as both a Unknown-level and Ultimate-level Digimon. The Unknown-level evolves from Gumdramon with 11400 HP, 3000 MP, 1000 Strength, 600 Stamina, 800 Speed and 50 Bonds, or by feeding an Arresterdramon evolution item to any Child-level Digimon. The Adult-level is able to evolve to the Perfect-level if feed a Perfect-level evolution item. The Ultimate-level evolves from Taomon or Megadramon. The Ultimate-level Arresterdramon can jogress with Ultimate-level Omega Shoutmon into Omegamon Alter-B. Arresterdramon can be found in Logic Volcano. Once it got defeated, it will joins the city and talking to it on Sunday gives your partners a boost when training. It slices enemies apart with the anchor on its tail! After being released from the Kinkoji, it evolved into this form. It is equipped with battle armor made of a special rubber, which gives it great defense power without sacrificing its flexibility. Its wings have also grown, allowing it to fly at high speed. 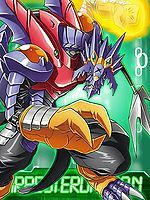 ↑ Digimon Xros Wars: "The UFO-Dinosaur Gathering! Ekakimon of Dreams"
↑ Digimon Xros Wars: "Us, the Digimon Hunters!" ↑ Digimon Xros Wars: ""The Golden Insect! The Mystery of Metallife Kuwagamon""
↑ Digimon Xros Wars: ""The Students Disappeared! The Flickering Shadow of Sagomon""
↑ Digimon Xros Wars: ""The Honor Student is Being Targeted! Blossomon's Smile""
↑ Digimon Xros Wars: ""The Digimon Hunt is Thriving! The Virtuoso Hunter of the Shopping District!!"" ↑ Digimon Xros Wars: ""Landing in Hong Kong! Protect the Super Beauty Idol!!"" 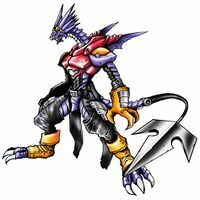 ↑ Digimon Xros Wars: ""Resemblance? Or None at All? The Disguised Phantom Thief Betsumon""
↑ Digimon Xros Wars: ""Great Undersea Adventure! Find the Treasure of Dreams Digimon!"" ↑ 15.0 15.1 Digimon Xros Wars: ""All Will Be Revealed Now! The Secret of the Digimon Hunt!"" This page was last modified on 8 April 2019, at 04:35.